The Tibor de Nagy Gallery is pleased to present an exhibition of recent paintings by Trevor Winkfield. The exhibition is his sixth with the gallery. The artist, who moved to New York from his native England in 1969, has developed a distinctive vision over the last several decades, employing dazzling color and flattened pictorial space. The artist combines in his paintings strikingly absurdist and unpredictable juxtapositions of disparate images, all rendered in a flat graphic style. His new paintings continue to enlarge his image bank to include feathers, birds, a turtle shell, Roman busts, moths, fish, flowers, a set of keys, and Corinthian columns. His paintings often hint at narratives, although they can also be read as carefully constructed abstractions with recognizable objects worked in the compositions. Each image is, for the most part, neatly confined, in a collage like fashion, to its respective section of the painting, delineated by contrasting bright colors and irregular horizontal and vertical shapes. 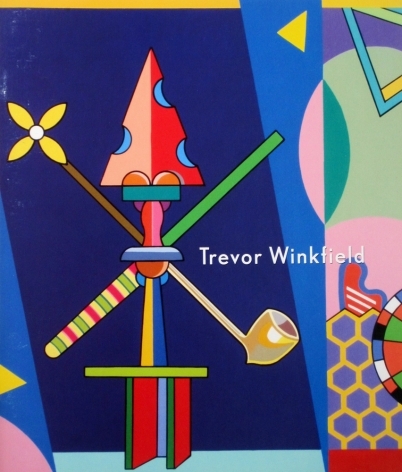 Winkfield’s work has been the subject of over 15 solo exhibitions throughout the United States. He has received numerous awards, including a Pollack-Krasner Award and a John Simon Guggenheim Memorial Foundation Fellowship. In 2002, Winkfield was awarded the Chevalier dans l’Ordre des Artes et des Letters by the French government. The artist has written extensively about art and is currently the co-editor of The Sienese Shredder, a journal on art and literature.